Pareto's Principle in Fundraising: An Interactive Example — Jeff Shuck. 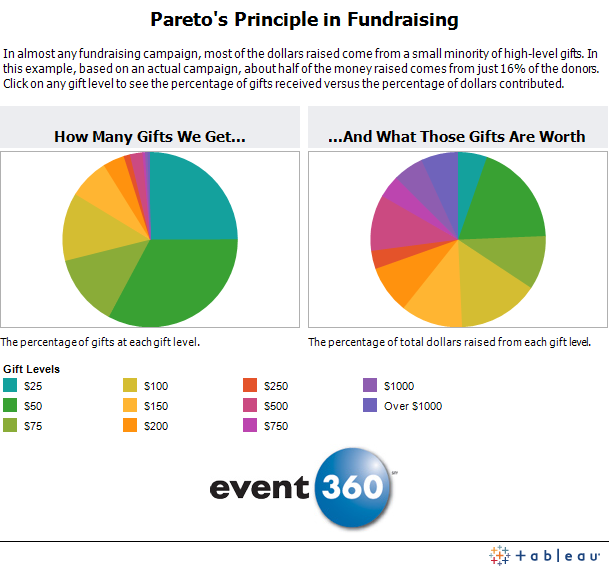 Over the last few months, I’ve presented and written quite a bit about Pareto’s Principle in fundraising. Better known as the “80-20 Rule,” the idea is simple: Most of the money we raise comes from a small number of donors. This dynamic shows up in nearly every campaign I’ve worked on. Even so-called “grassroots” campaigns are heavily dependent on a small number of donors; just because we ask for small gifts doesn’t mean all of our donors contribute equally. What is just as amazing to me as the math, however, is the fact that many people have trouble getting their heads around the idea. Even though most of us use donor pyramids and gift tables every day, it is often hard to understand how even massive programs are really driven by small percentages of donors. This interactive graphic, built from actual campaign data, is designed to help illustrate Pareto’s Principle. Click on any gift level to see how many donors contributed at that level — and how much of the total revenue those gifts represented. All of this begs at least two questions: Are you trying to grow large numbers of donors or are you spending time finding and cultivating donors who are connected to you? And do you treat donors equally or do you talk to them differently based on how important they are to you?